This church has a Late Saxon round tower dated to 1050 to 1100 with blocked double splayed windows and some modern ones. Some lava blocks have been built into the tower. The rest of the church is in Decorated style except the south porch that has unusual Perpendicular style windows in brick. 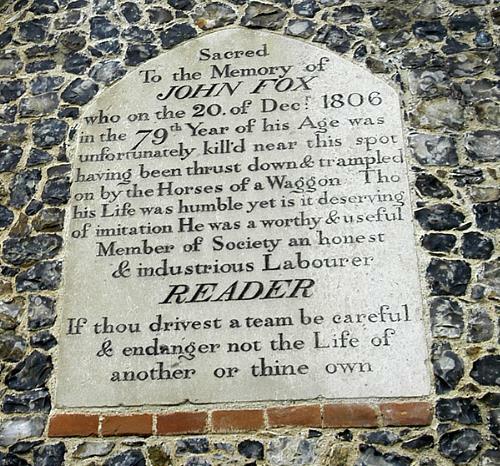 Over the entrance to the porch is a memorial dated 1806 to John Fox incorporating a warning to dangerous drivers. Excavations here to build some soak away pits have recovered fragments of post medieval tile and jumbled human bone. Late Saxon round tower (see (S1)). 1050 to 1100 with blocked double splayed windows (and modern ones). Norman tower arch. There is a squared section joining tower to nave, but that this is not the original nave itself is shown by the nave northwest quoins, which contain lava blocks - perhaps the 'Neidermendig lava querns' that  claimed were built into the tower. Northwest quoins of squared 'junction' also have lava but also flint and stone. No lava in southwest quoins. Quoins at nave southeast corner also, but all stone here renewed. est of church Decorated, but nave windows are not strictly in alignment on south, and above porch there are traces of a higher and smaller blocked window with brick arch; and possible faint traces of another to east. Chancel south windows are 19th century renewals, as is east window; the brick arch above shows it was once much larger. Nave north windows also renewals. One done in Y tracery. Blocked north door, very small. South porch has unusual Perpendicular style windows in brick with 'brick tracery'. Some brick old, some renewed. Entrance to porch renewed with memorial over of 1806 warning dangerous drivers. Octagonal carved font on 'Maltese cross' base. Tomb chest 1575. Chalice brass 1502. Stained glass in a north window by Wooldridge 1874. Chalice (Norwich) 1567 Flagon (London) 1728. Some good tombstones in churchyard. Interior inaccessible. Interior details from (S2). E. Rose (NAU), 13 October 1976. Soakaway pits each 1.30m deep and 1m diameter dug at southeast corner of porch and immediately south of tower. Neither reached natural, all black soil, some tile fragments and jumbled bones. A. Rogerson (NLA), November 1994. In the chancel is buried John Brooke, husband of the writer Frances Brooke. E. Rose (NLA), 14 August 1998. --- Monograph: Brown, G. B. 1903. Anglo-Saxon Architecture. The Arts in Early England. Vol II. p 449. --- Publication: Cautley, H. M. 1949. Norfolk Churches. p 5. --- Article in serial: Ashley, S., Penn, K. & Rogerson, A.. 2011. Rhineland Lava in Norfolk Churches. Church Archaeology. vol 13, pp 27-33. p 31. --- Leaflet: The Parish Church of St. Andrew, Colney..
--- Archive: Heywood S. (HES). 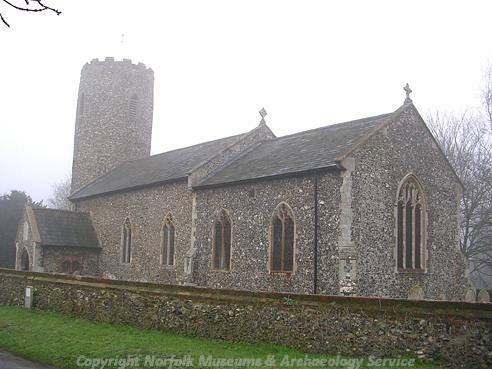 Norfolk County Council Site Record - St Andrew's Church, Colney. --- Archive: Clarke, R. R. and NCM Staff. 1933-1973. Norwich Castle Museum Record Card - Late Saxon. Colney. <S2> Serial: Pevsner, N.. Pevsner. <S3> Article in serial: Atkin, W.. 1997. A Most Ingenious Authress (sic).. Lincolnshire History and Archaeology. Vol 32, pp 12-30.